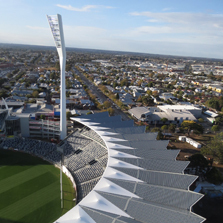 Geelong Cats were under the spotlight at the first ever game under newly installed light towers at Simonds Stadium on June 1st. Simonds Stadium is the home ground of the Geelong Football Club, an Australian Football League stadium located at Kardinia Park, Geelong, Victoria. Aurecon was engaged by the architect, Populous, to engineer light towers which will allow the TV broadcasting of night football and cricket matches at the stadium. The detailed sports lighting design was undertaken by the floodlighting luminaire supplier, Sylvania. Aurecon undertook concept design sports light modelling, wind tunnel testing and a 3D finite element structural analysis for this complex project. The towers were formed as a tubular structure similar to wind turbines in order to suit wind turbine manufacturing processes. Contrary to standard wind turbine structures, the tube was bifurcated near the top in order to form the frame for the lights. The tower tubes were modelled by Aurecon using the 3D finite element software Strand7 and optimised to reduce the tube wall thickness to minimise the overall steel weight and cost of the structure. The solution was backed up with extensive wind tunnel testing on the towers by Aurecon technical expert, Neil Mackenzie to ensure the dynamic response to wind was acceptable. In an added feature, a building maintenance unit lift was installed from the base to near the top. This was a boon for construction workers and maintenance staff accessing the head frame. Simonds Stadium is made up of a variety of stands. Aurecon was also the design engineer for the ‘Players Stand’ which was opened at the same time and the design engineer for the ‘Premiership Stand’ which was constructed in 2010 and the ‘Reg Hickey Stand’ which was constructed in 2005.